Stillwater Associate Mike Leister, offered a presentation at the AFPM Annual Meeting entitled How EPA’s Recent RFS Changes for 2014, 2015, and 2016 will Impact Various RFS Program Participants. EPA’s changes to the Renewable Fuel Standard (RFS) are meant to encourage the growth of production and use of biofuels. This is an initial step to drive greater E85 and perhaps E15 sales in order to eliminate the E10 blendwall. Michael’s presentation provides an analysis of the changes to the standards, examines what the changes mean for the RIN market, and how the changes will impact Obligated Parties and Consumers. EPA’s changes to the RFS will lead to tightened D6 Renewable Fuel RINs supply, raising D6 RIN costs. EPA hopes that the price of D6 RINs will increase to the point where new E85, and to a minor degree E15 sales, are encouraged. EPA has estimated that D6 RIN costs must rise above $1.00 to encourage this behavior. In the meantime, D6 RIN supply will start to dry up and Obligated Parties will use non-ethanol RINs to meet their obligation. 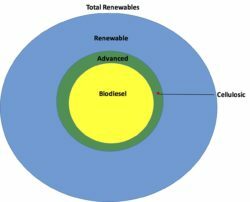 The presentation points out that because biodiesel production infrastructure is relatively low cost and can expand quickly, biodiesel volumes and biodiesel RINs will be the relief valve for the RFS in 2016 and probably 2017. In 2016, EPA’s efforts are likely to increase the generation of biodiesel RINs and to reduce the volume of carryover D6 RINs. If EPA continues its course in the future, E85 is likely to be the fuel of choice for generating RINs above the E10 blendwall.